Ryobi introduces the new One+ 18-Volt Lithium-ion Pole Saw. 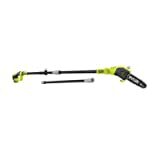 This cordless pruner extends up to 9.5 ft. with the extension pole, and is ideal for trimming away those dead and unsightly limbs and branches. This trimmer includes the 18-Volt Compact Lithium-ion battery, and completely recharges in just 30 minutes. The battery provides fade-free power to keep running strong from the beginning to end of the charge, and the battery powers all of the tools in the Ryobi One+ system. This Kit includes ZRP4360 Cordless Pole Saw, (1) P102 Compact Lithium Ion Battery, 1 P118 Dual Chemistry Charger, Extension Pole, Carry Strap, and Manual. Replacement Chain Part # 901289001. This is a factory reconditioned product. Reconditioned generally means that the product has been returned to the manufacturer, who brings the product back to fully functional condition. Some products may contain cosmetic blemishes, scrapes, scratches and dirt but should work like new. Products containing oil may have spillage in transit. The factory provides a 1 year warranty available through a nationwide network of service centers. Purchase receipt is required.